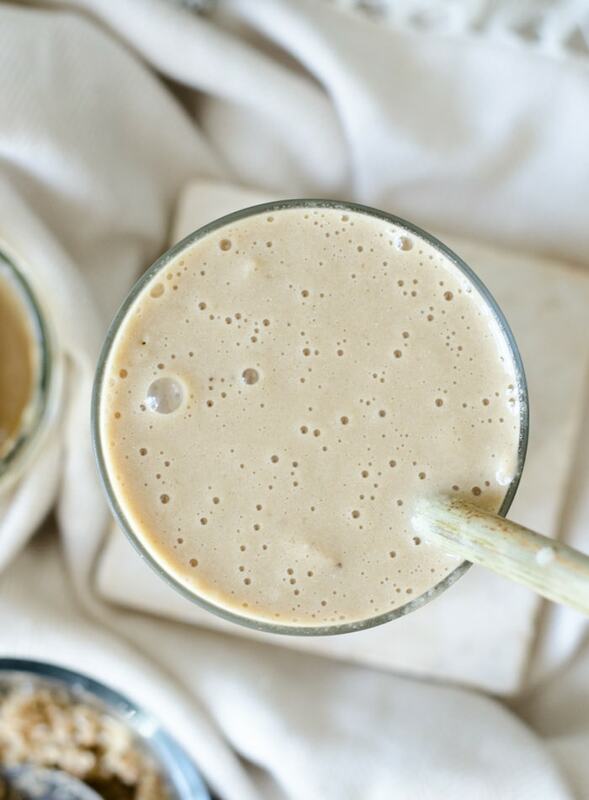 This Tiramisu Smoothie is dangerously close to dessert but I say it’s still healthy enough to call breakfast. It’s made with coffee, frozen banana, vegan vanilla protein powder, pure vanilla extract, cacao, sea salt, cauliflower and coconut yogurt. That’s close enough to breakfast for me. It’s thick and creamy and with vanilla, coffee and chocolate, it’s got all the flavours you’d find in classic tiramisu. And just in case you were unsure if this could be dessert or not, I topped it off with a quick and easy, oat walnut cookie crumble. Can you still eat it for breakfast? Ya..sure, why not?! 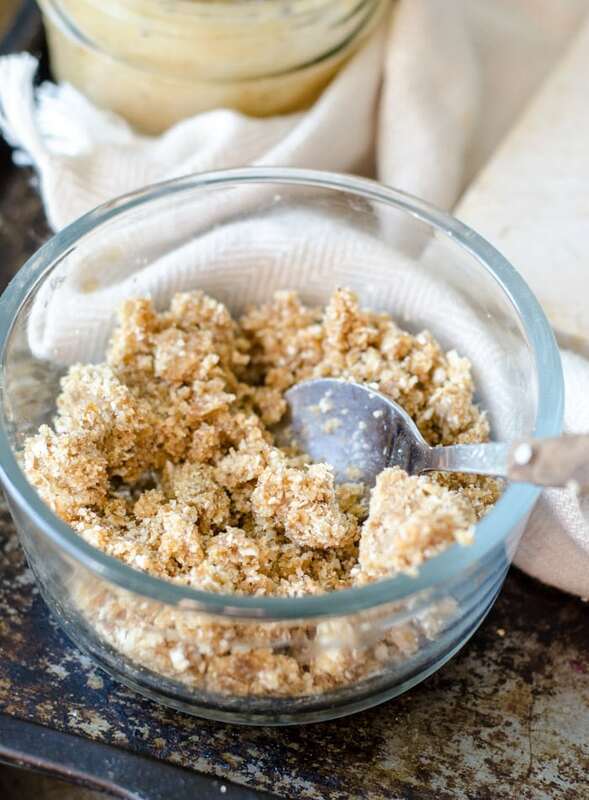 To make the cookie crumble, I added 2 tablespoons of oats, 2 tablespoons of walnuts, 3 small dates, a few drops of water and a pinch of sea salt to my blender and pulsed a few times until it resembled crumbly dough. You can play around a with the amounts, use a different nut cashews or try it with coconut in place of the oats or walnuts. You’ll want to use soft, fresh dates otherwise it will be too crumbly. If you’re dates are dry, pour boiling water over them and let them soak for 10 minutes before draining and using. I may or may not have also added some tahini date caramel to my smoothie. 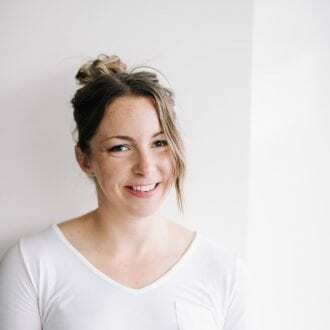 If you’re intersted in that, check out this post for the how-to. Now I’m thinking…would coconut whipped cream be too much? If you want to test that idea, place a can of coconut milk the in the fridge overnight. In the morning, open it up and scoop the thick cream off the top and into a bowl. Using a fork, whip the cream vigorously until it’s nice and fluffy then fold in a little maple syrup to sweeten it. Boom, coconut whipped cream! 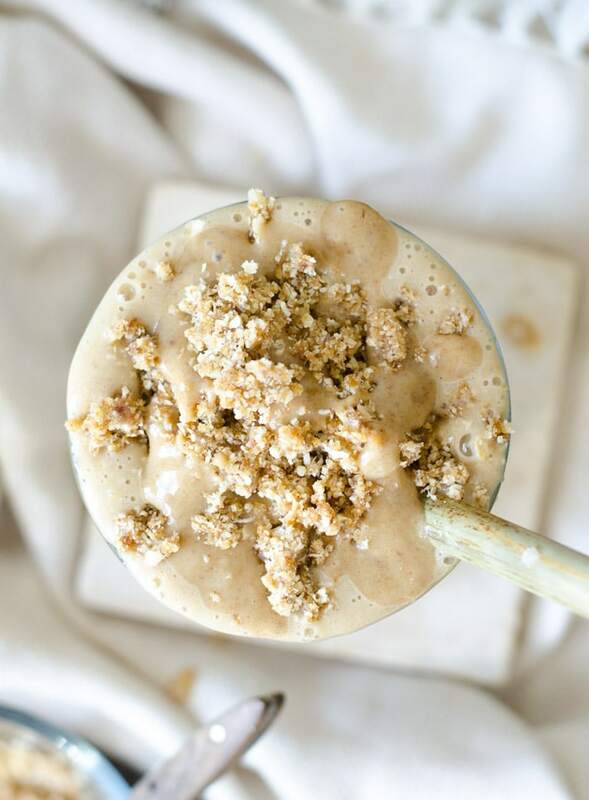 If you want to make this a super thick, soft serve ice cream-like smoothie bowl, add everything to the blender except the coffee and start blending. If needed, slowly add a little coffee to get it to blend. If it starts blended up without coffee, and it should with the yogurt in there, add some espresso powder or Four Sigmatic Mushroom Coffee for the coffee flavour. This tiramisu smoothie is verging on dessert, I know, but it has cauliflower in it so that’s gotta count for something right?? Maybe we can sneak it by as a salad…maybe? As for the dairy-free yogurt, you can use any homemade or store-bought plant-based yogurt. Coconut, cashew, almond and soy yogurt are all good choices. My favourite is So Delicious but I can’t always find it in my area. They have an Unsweetened Vanilla Coconut Milk that would be perfect. The Dairy-Free Greek Yogurt from Daiya is also really good but I can’t always find it. They have Plain and Vanilla Bean and they’d both be perfect in this recipe. I find the Coconut Milk Yogurt from Silk to be quite runny without much flavour but I’ve still used it in this recipe. I’m in Canada and we don’t have quite as much selection as you do down in the US, so if you know of a good brand, do share in the comments! Another option is to make your own dairy-free yogurt which is actually really easy. 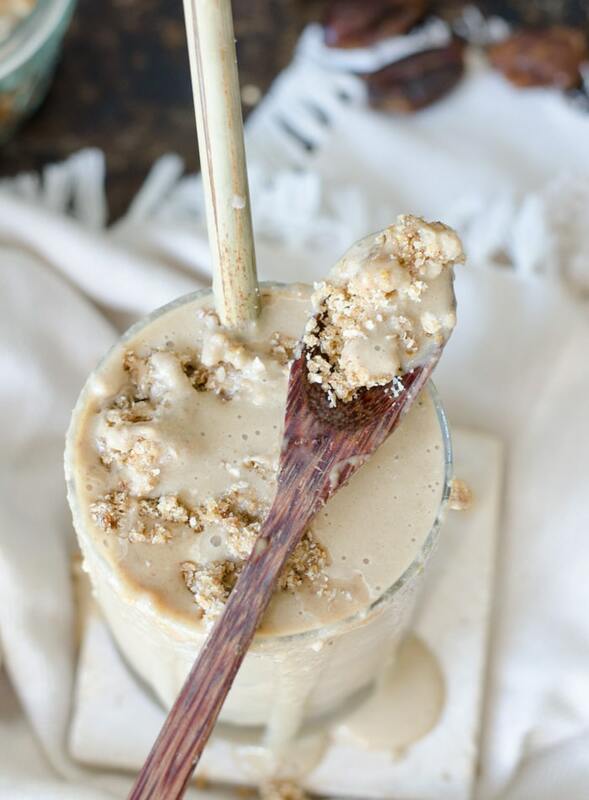 You can make coconut milk yogurt from canned coconut milk and cashew yogurt from raw cashews. Homemade is definitely a good option because you’ll know exactly what’s going into it. I don’t have a plant-based yogurt recipe on the blog but you can try this coconut yogurt from Minimalist Baker or this cashew yogurt from Pickles and Honey. 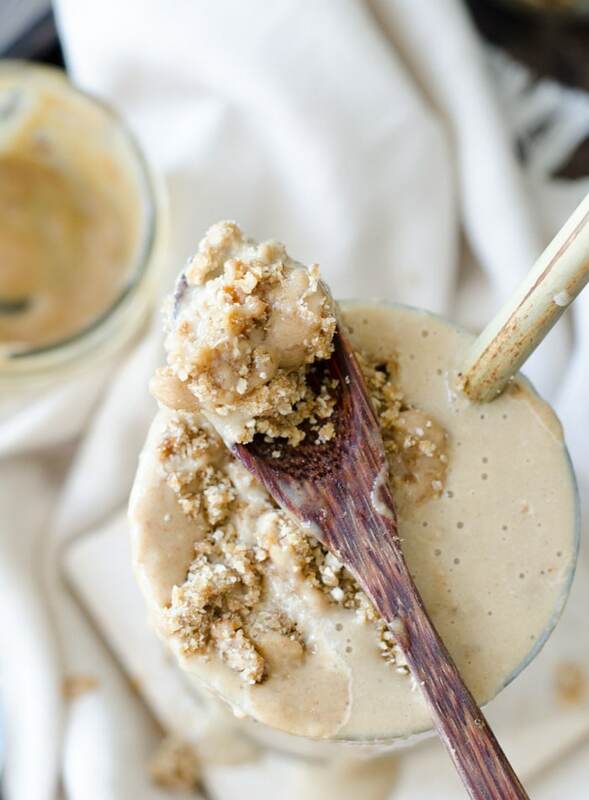 The quick cookie crumble is your vanilla wafers, the non-dairy yogurt fills in for cream cheese and of course, you can’t forget the coffee in anything inspired by tiramisu. 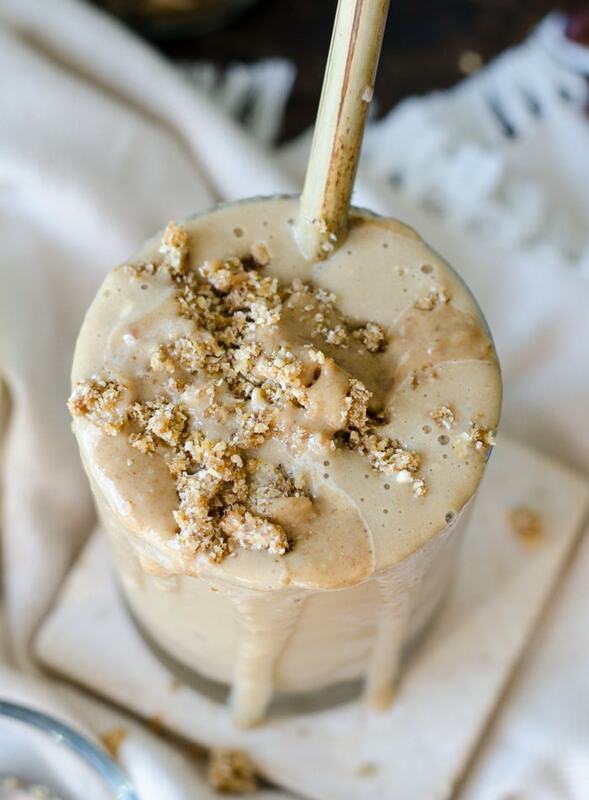 Frozen banana, vegan vanilla protein powder and cauliflower adds volume and nutrition and it’s all blended up and topped off with a quick vanilla cookie crumble. Add all ingredients to a high-speed blender and process until smooth and creamy. To make the cookie crumble, pulse the ingredients together a few times until it resembles crumbly dough. Sprinkle it over your smoothie and dig in! haha, ya! I’m all about the sneaky veggies. This loooks so good I’m going to try it out ???????? honestly this sounds so good! question tho, Not a coffee drinker, what can I add instead? You can just use almond milk or water but decaf would be best to at least get the tiramisu flavour! Earl Grey or Chai tea might be fun too! Yum! love all the alternative options! The cookie crumble topping looks incredible! I’m concerned that you are questioning whipped coconut cream. Never, and I mean NEVER deny the whipped cream!! So good, girl! Hahah…I don’t know what I was thinking. The answer is obvious. Oh. My. Goodness. This looks HEAVENLY! 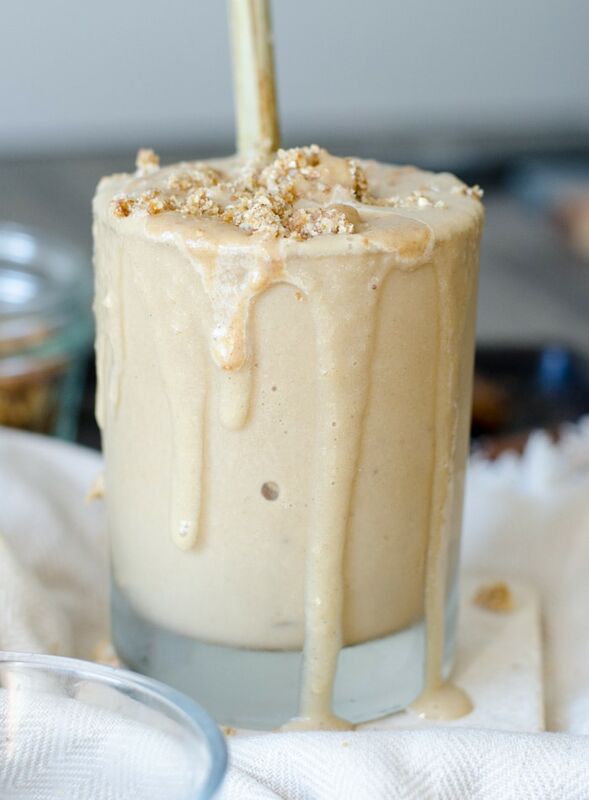 Love how creamy and delicious this smoothie looks. Would love to make this for my fam soon! I am a sucker for coffee! I love this so much! I cannot wait to try it out! O.M.G. That looks awesome. I am doing a vegan slow-carb diet right now, but this is now on my list for cheat day! For me personally, this would make an amazing dessert – or something to have on a hot day. I don’t think I’d ever have it for breakfast. But, then again, I love savory breakfasts no sweet ones. That doesn’t stop it from looking amazing though. I’m sure it tastes as good as it looks! I love tiramisu. Nothing can compare with a delicious tiramisu and a Vietnamese coffee. I will try this just tomorrow. Thank you for this awesome post. Keep it up! Are you using medjool dates or small ones? The recipe lists 3 small dates. If you’re using medjool, I’d just use 1. Enjoy!